An arborist is defined as a “tree surgeon.” He or she knows all about trees– and can tell if they’re healthy or not. If they’re not healthy, the arborist knows how to “treat” them much like a doctor gives medicine and care to a human patient. Maybe you’ve noticed there are some trees on your property that don’t seem to be “doing well.” You’re not quite sure what’s wrong, but you’re pretty sure something’s up and you’d like a professional opinion. That’s when you call an arborist. What are some tips for selecting an arborist? First, you can check in the “Yellow Pages” (or online) for local companies that fall under the heading of “Trees.” If you have a phone book handy, and you can find a company listed under Trees, then there’s a good chance that company is serious about what they do, since they took the time and money to create an ad or listing in the local listings. Contrast that with “door knockers.” If someone comes to your door, knocks on it, and tells you they’re “in the area” after a storm and want to work– asking if you’d like them to do some work for you– be wary. They may not be on the up-and-up. Also, if a salesman tries to pressure you into taking the “great deal” today and offers “big discounts” and wants you to “sign here right now,” those can be red flags. Again, be wary. If you want to know if an arborist is serious about what they do, then ask to see their license and/or important paperwork signifying that they’re professional. You can ask to see their certificates of insurance, including proof of liability and workman’s comp. You might even go so far as to call their insurance company and find out if they’ve been connected for years, indicating they’re legit. 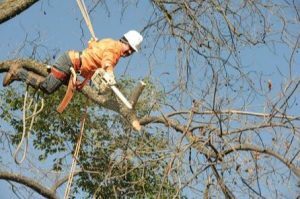 Some arborists, as with any other profession, can obtain a certificate but not actually pay for their policy– so it’s important you do your homework to make sure they’re not liars and cheaters. It’s always a good idea to get more than one price quote, such that you’re asking around to see who offers what, for what price. Meanwhile, ask for local references and find out what people have said about the company’s past jobs. For example, Forest Tree Service of Kingwood, Texas, shares testimonials here. Looking for an arborist in Kingwood? Contact Forest Tree Service at 281-359-7874.